Apple's 4 June WWDC keynote is over and the September release date for the 2018 iPhones is drawing ever nearer, with Apple's new phone sure to spark delight and debate in equal measure. A key factor in Apple's phones is the design, of course, and while techies salivate over the likes of the new Apple A12 processor, more design-minded experts are starting to look beyond the internal components, to picture how the new iPhones might actually look. 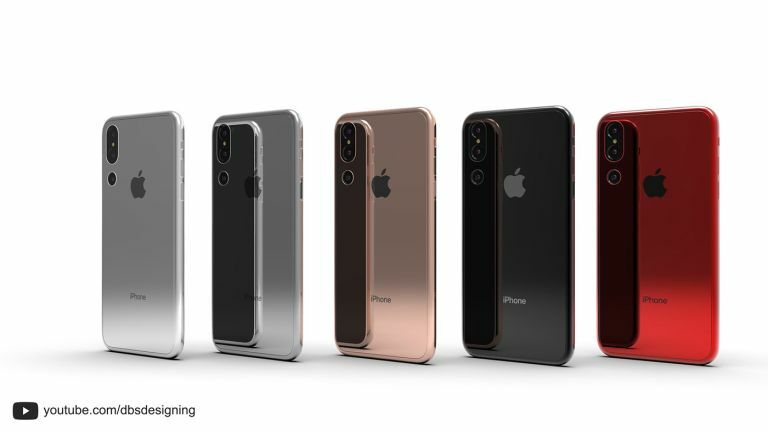 These slick-looking renders of the new iPhone X, which were created by Muhsin M. Belaal Auckburaully of DBS Designing, are certainly whetting our appetite. The 2018 iPhone X concepts show the handset sporting no fewer than three rear-facing cameras – a feature that's been rumoured for the new iPhone since they made an appearance on the Huawei P20 Pro. Apple makes a big deal about the photo prowess of its iPhones so adding an extra camera to the handset is a distinct possibility. Up front, the new iPhone now has two selfie cameras, beating the current iPhone X by a factor of one, and also what looks to be an upgraded Face ID system. The renders also show a new matt finish on the bands that run around the edge of the iPhone. As for colours, DBS Designing reckons we'll see some new choices this year. There's a vibrant red, matching the colourway of the special edition (RED) iPhone 7, and there's also gold and silver, bringing the choice of iPhone X colours up to five. In terms of spec, the new iPhone X will likely use a new Apple processor – the 7nm A12 chip – to bring significantly improved performance compared to last year's iPhones. We're also hearing that alongside the new iPhone X, there will be a larger iPhone XL to take on Samsung's Galaxy Note 9. For an analysis of all the iPhones we're expecting in 2018, check out our 2018 iPhone range overview. And then enjoy the video below with its suitably epic soundtrack for more of the imagined 2018 iPhone X.